This virtual board game is challenging and complex in a way that disturbs the flow and fun. There have been plenty of times when I’ve found myself sitting around a table with friends and a board with dozens of little pieces strewn about; cards placed in a very specific and particular order. A friend of mine was on a board game kick for some time there which means each time he bought a new one, there’d be more manual reading of rules and regulations. Looking back on these nights now, I can’t help but cherish them. Some were winners, some were rough. And while the games always ended up being at the very least interesting, the instructional phase that always had me stupefied and bewildered. Those manuals can often act like exorbitant info dumps that feel very “in one ear, out the other”. With video games, tutorials give a slow burn of ingredients that make up the recipe of the game. You’re able to go through these interactive tutorials at your own pace and figure things out on your own while also partaking in the action itself – a great way to build up a muscle memory of sorts that helps pull off the various tasks at hand. In the case of Armello, they decided to just throw everything at your face at once in the hopes that some of it will stick. In fact, the complexity of the tutorial immediately threw me under the confusion bus and I imagine it would do that to anyone trying to give the game a fair shake. System after system after system is being introduced left and right with terminology that just seems so commonplace to their vernacular yet so distant from our own. Half way through the tutorial I found myself getting more and more confused by how many systems are actually in play. Maybe that just says something about me or the state of mind I was in during that info dump, but it just seemed far too much to handle at one singular time. Fortunately, once I got past these tutorial stages, I was able to make sense of everything a little clearer, and found myself enjoying the game much more. 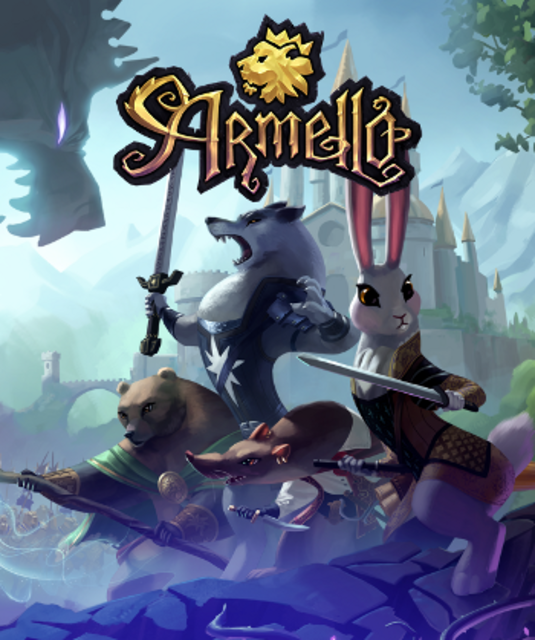 Armello, from League of Geeks, is a solid attempt at bringing an actual board game experience to the virtual space. It’s capable of delivering all the things you come to expect from a board game. It’s nearly a one-to-one version of what an actual board game might play and look like if Armello were actually based off a real-life physical board game. While the complexity might not be something that I enjoyed with Armello, it’s still impressive and it’s understandable that others would get further into the mechanics than I.
I’m going to do my best to explain the game in the most layman terms possible – something that an earlier version of myself would understand: The King of Armello has become infected by a disease known as “Rot” and will die very soon (9 turns). Your character is up against three others as you go around doing quests and exploring a hexagonal-grid of mountains, swamps, forests and dungeons. You’re presented with a few means of victory conditions (Combat, Prestige, Spirit Stone, Rot) but all of them end with you becoming the new leader and your clan rising to power. Once everything made sense, I figured I knew what I should do and how I should move forward. Unfortunately, the game’s AI and overall flow makes the game difficult to get much, if anything, done. Which is a shame because every step I took, I felt like I was getting more understanding of the game while also getting further from my goals. While the AI players around me were doing their things with no problem, I kept dying. The consequences for dying are nowhere near severe as you just start back from your starting point on the board, but I would continuously perish and have to walk back to the objective I was trying to reach in the first place. Since the game only give you 9 rounds, it seems highly unlikely that I could ever complete the tasks at hand. A lot of my follies can be possibly attributed to the fact that I am just bad at the game. After a dozen or so matches, it was clear to me that I have not quite mastered what the game has given me. But while some tough games can feel like you’re accomplishing something in a run, Armello makes it clear that if you’re not doing well a good portion of the way through, there’s no way you’re gonna make it out as the victor. The pacing certainly feels like a board game as well. While I am not against waiting for my turn, it can make each session feel too lengthy, especially when it’s just the AI players you have to sit and wait for. You’re given the ability to hold the right thumbstick to fast forward the action, but I found myself holding down that thumbstick more often than I was playing the actual game. As for the Switch, the game seems to run just fine and the touch screen makes some functionality feel neat like the dice rolling and placing cards. But, as the issue with many Switch titles, the font size can feel microscopic at times and they seem to be cramming far too much in such a small, undocked space. It’s not a deal breaker by any stretch, but if you typically find yourself searching for a nearby magnifying glass, then you might want to play this on a slightly larger and up close screen. It’s a shame that Armello didn’t grab me the same way that it did for many people. The art is incredible and the ideas are there, it’s just too much at times and it can feel bloated and unnecessarily challenging in a way that doesn’t feel rewarding. The game might be better with real life opponents sitting across the table from you, but unless you’re willing to take the time to learn the game’s idiosyncrasies then you might want to look elsewhere.